You can't imagine a soulful Assamese meal without a fish curry. 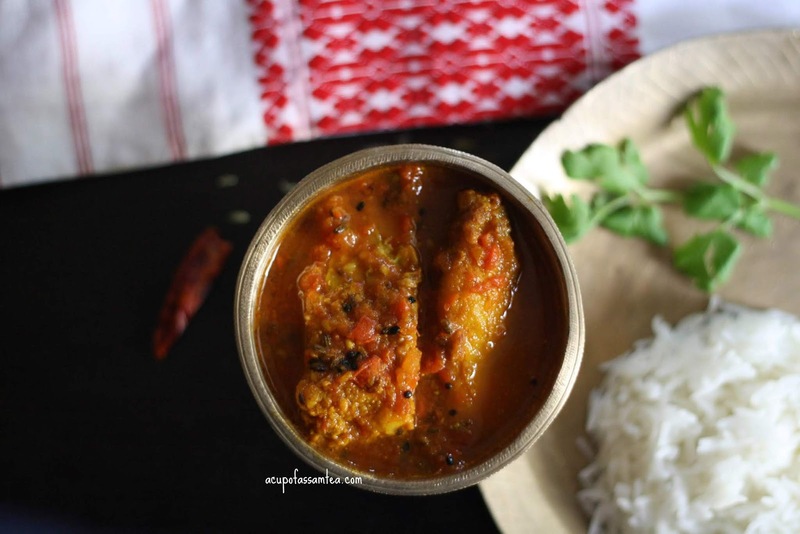 The fish curry transports me to my Grandmother's kitchen. I tiptoed entered the kitchen and wearing mekhela chadar the affectionate lady a few dots of turmeric here and there on her clothes, frying fish and making curry, and she caught me and trying to feed me bite by bite and from our garden night jasmine exuding fall fragrance what a soulful sight. It was more than 30 years those smell, place, gestures felt like yesterday. Let me tell you my grandmother made the world best curry and then my mom. Lost my grandmother at the age of five. I was so little that I couldn’t learn my grandmother's recipe but my mom taught me how to make a good fish curry. 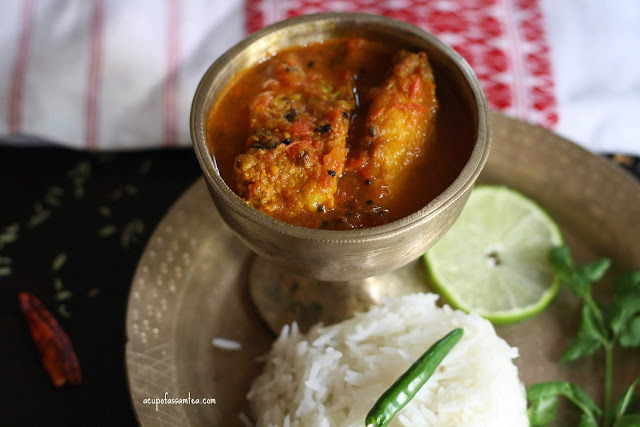 In my assamese household as a child, we used to eat fish way more often than chicken. As an expert cook my mom made fish with all kinds of veggies. Her fish curry is very delicately prepared. 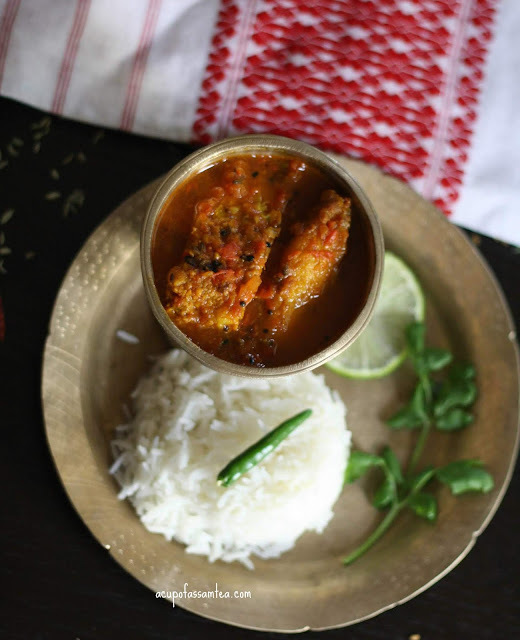 She always says, to make a good fish curry you have to be really patient and good food very much depends on how you fry the fish, neither deep fry nor sallow, it must be in between. It is like a proper rendition of music a bit of mistake can spoil the curry. If you follow the right steps it is very easy to make. 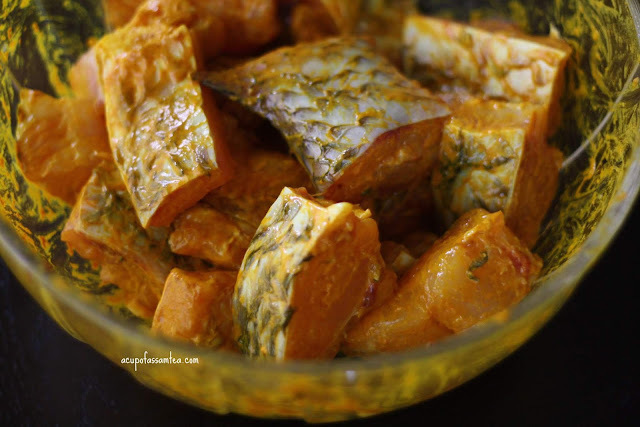 First, marinate the fish pieces with turmeric and salt. Let it sit for half an hour. Now let the gas on and place the pan. Add the oil let it become hot, once it is hot put the gas on medium flame and fry the fish pieces. Flip the pieces occasionally. 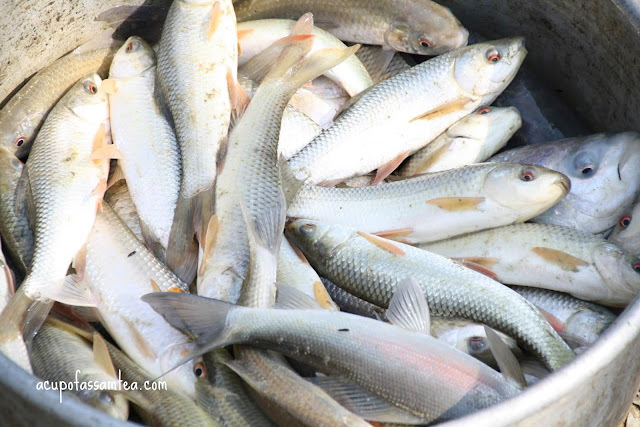 Too much stir can break the fish. It takes about 5 to 7 minutes. Once it is cooked put it aside in tissue paper. Now grind the tomatoes or you can chop it. I like to grind as it makes my job easier. 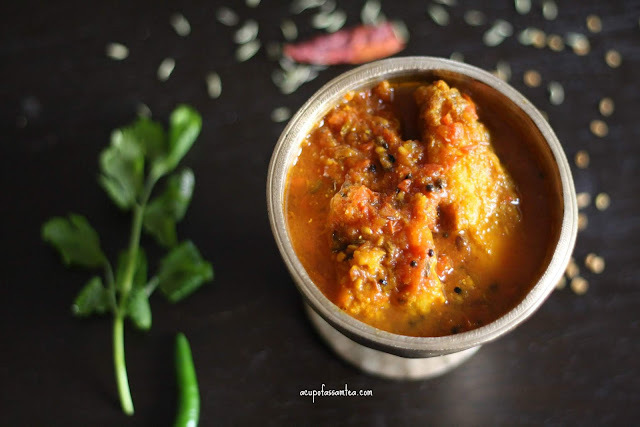 In a separate pan put one teaspoon oil, once it gets hot add dry red chilies, fenugreek seeds, black cumin seeds. Add the turmeric and little bit of salt and chili powder which is optional. Then add the ground tomatoes. Let it cook for 7 to 8 minutes. Once it is cooked properly, add two cups of hot water. Let it shimmer and now slowly add the fish pieces. Put it in a slow flame, let it cook for 10 to 15 minutes. Now squeeze the hint of lemon. Finally, garnish with a few cilantro. Serve with steamed Rice. Ooh I love fish dishes but don't know many recipes so this one is perfect- I'll definitely try it out!